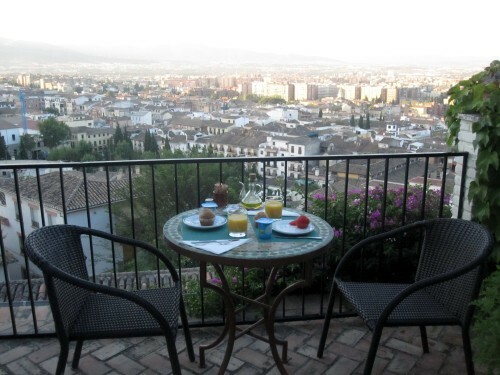 Located a convenient 10 minutes away from the Alhambra and tucked away from the town center with commanding views of the city, Carmen de la Alcubilla del Caracol is a perfect choice for a small bed and breakfast stay in Granada, Spain. The small hotel has only 7 rooms, all with a view and all with access to beautiful hotel gardens and seating areas. View from our private terrace, Granada, Spain. Price. The rooms were €120, €130, or €140 per night for our September stay, plus €8 per person/per day for breakfast and then 8% added for taxes. 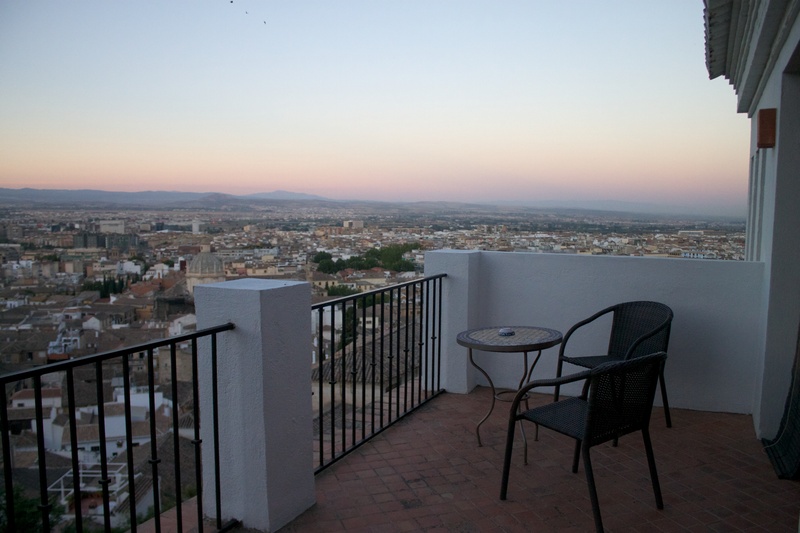 We opted for the super double room with the private terrace, which was €140. However, all of the rooms are supposed to have a view, and the rooms for €130 even have shared or small balconies from which to enjoy Granada from above. Location. The location is fantastic. The hotel is situated above the main center of Granada, so we walked down to get into town. We visited the Alhambra twice during our visit (day and night), so it was perfect to be able to walk there in only about 10-15 minutes. Room. Our room was huge with two twin beds pushed together to make a king. We were on the top floor (2 above reception) and the only room on that level. Because it got so warm during the day, we opened up our doors once the sun started to set and let the cool night air into the room. Dining. As I mentioned above, breakfast was available at the hotel for €8 per person. Guests are only charged if breakfast was consumed, so there is no need to try to pre-plan. It was served from about 8:30-10:30 and consisted of yogurt, fruit, tomatoes, bread, and something a little special – toasted bread with ham and melted cheese on top. This was our absolute favorite, and our host gladly prepared it for us! And we were set up with the best seat on the breakfast terrace both mornings that we had time to dine before heading out (pictured above). The hotel also had a small kitchen area with snacks and drinks (including beer, wine, and other alcohol). There was a price list on the counter and guests could take anything they wanted and just keep track on a piece of paper. We took a bottle of wine up to our room more than once to enjoy on the terrace! Amenities. Free wifi, breakfast (for a fee), a large reception area with travel books available for guests, and a stocked kitchen (snacks and drinks for a fee). The owners were also very helpful for transportation to and from the hotel. It can be a headache getting to some of the smaller hotels, but we had absolutely no issues. Our stay at Carmen de la Alcubilla del Caracol was very enjoyable and I would recommend this hotel to visitors who will be touring the Alhambra, since the proximity was a huge convenience. This entry was posted in Hotel Review, Travel and tagged Granada, hotel, Portugal/Spain 2012 Trip, Spain by Kristin. Bookmark the permalink.